Well, its been another busy golfing week for us all and still the sun shines. The courses are beginning to look a little like a desert, but the ball does roll! Thursday’s monthly medal was won by Hazel who again had a stonking round with a nett 65 and now plays off 16! Although yours truly also carded a nett 65, Hazel won on a card play off... Congratulations too to Caroline R who had a brilliant nett 69 and now plays off 31. Well done all and a big thanks again to our greenkeeping staff who have kept the greens to a very high standard allowing us to shoot low scores. No doubt we will all be moaning in the winter when we can’t play off our new lower handicaps!!! Please settle your balance of £30 with Pat for the Away Day on August 2nd if you haven’t already done so. Margaret has arranged a great day and I am really looking forward to it. We will be finalising the draw this week so will let you know all details in due course. For those not aware we play a 4 round Summer Eclectic in August each year on a Tuesday. In order to simplify the admin of this competition the sign up and sign in will be via HDID. If you signed up on the board for the first round on 31 July, then you will have been transferred to the system this week. 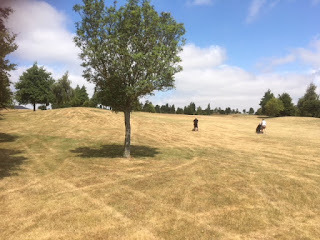 Please therefore check your tee times for 31 July on line and then the next rounds will appear on HDID as normal. Any queries please contact Lin Goodey. The Scratch Team played away at Brickendon Grange on Friday in their penultimate match of the season. Unfortunately the girls from Brickendon took revenge on their defeat at Chesfield last week and beat us 4-1. 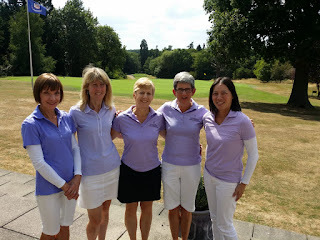 Well played to all the team and our last match is away at Berkhamsted on Mon 23rd July. The weekend Stableford was won by Karen Morton with 38 pts who again had a handicap cut. Well done Karen. I am sorry that I will not be around to play for the Lorraine Palmer Cup on Thursday this week but hope you all have a great day and play nicely with your partners! Long may the sun continue to shine (but some rain at night might be useful!). Have a good week.